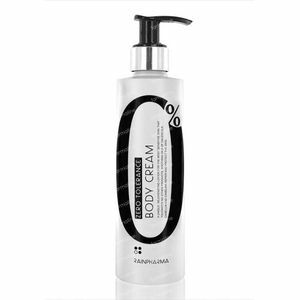 Rainpharma Zero Tolerance Body Cream 250 ml order online. purest ever. This product is 100% free from added scent and colouring agents, and contains no aggressive preservatives. Each ingredient in this precious formula is plant-based and natural. A unique, rejuvenating lotion for the most sensitive skin that tolerates no other products. AQUA, CAMELLIA OLEIFERA SEED OIL, CAMELINA SEED OIL, CALENDULA OFFICINALIS FLOWER OIL, GLYCERYL STEARATE CITRATE, GLYCERIN, CETOSTEARYL ALCOHOL, GLYCERYL MONOSTEARATE, GLYCERYL CAPRYLATE, SODIUM ANISATE, XANTHAN GUM, TOCOPHEROL, CITRIC ACID.